No matter what your level of physical activity is, there might come a time when you are injured while working out or playing sports. Everyone from professional athletes to weekend softball players run into pain that a sports physician can diagnose, treat, and help prevent future issues. However, not every situation will require a visit to a sports physician. With that being said, we wanted to put together a list of questions we receive regarding sports injuries to help you know when to see a doctor and when to let it heal on its own. For athletes and non-athletes in the Chicago area, Chicagoland Complete Healthcare can help you with everything from sports injuries to routine checkups. -What are the most common sports injuries? We dove into the most common sports injuries and how to prevent them previously, but the ones we see the most often are sprains, strains, irritation of the knee, Achilles tendon pain or numbness, shin splints, fractures, and swollen or bruised muscles. Another common issue that can happen with any active person is plantar fasciitis, which is swelling and irritation of the bottom of the foot. -If I get injured, should I push through the pain? Though playing while someone is injured has been celebrated through sports history, the fact of the matter is this will only make your injury worse. It is never a good idea to ignore pain, as it is your body’s alarm telling you something is wrong. You can exacerbate muscle tears and broken bones if you don’t stop when you’re injured. The last thing you want is a broken arm that won’t set correctly because you kept playing through the pain. -Can a sports injury be treated at home? It depends on the type of injury, but many can be helped on their way to healing with the RICE method. RICE stands for Rest, Ice, Compression, and Elevation. The RICE method is most effective when dealing with inflammation, which is the most common cause of pain from an injury. Depending on the severity of the injury, you may be able to continue to stay active, though at a somewhat reduced pace. Swollen muscles, for instance, are something you can work around. If the injury is more severe than that, rest up as much as you can until the pain subsides. Within 12 to 36 hours of the injury, apply ice to reduce the swelling and wrap it with an ACE bandage to keep the area tight and stiff. After you’ve done that, elevate the injured body part to allow gravity to bring excess fluids away from the injured area. This will help to reduce swelling as well. -When is it time to see a physician? Sports injuries are often either acute — happening suddenly during exercise — or chronic — developing over a long period of time. While both acute and chronic injuries can be treated at home, if the injury is severe — such as you think you have a broken bone or you’re bleeding excessively — or the pain continues at the same level five days after you’ve treated it, you should see a doctor. Symptoms of an acute injury include bruising, swelling, deformity (i.e. bone dislocation), an inability to place weight on an extremity, and overwhelming sharp pain. A serious acute injury like a sprained ankle or torn Achilles tendon needs to be treated at the emergency room immediately. Chronic injuries are brought about by overuse. Some examples of chronic injuries include tendonitis, shin splints, or stress fractures. These are often a result of repetitive training, poor stretching, or problems with gear or equipment. Chronic injuries are usually accompanied by persistent, yet dull aches that gradually get worse. If you are numb, limping, or have severely reduced flexibility, you should see a doctor. This all comes down to what the actual injury is. All recovery takes time, but the severity of the injury could mean it’s as short as four weeks to many months if surgery is necessary. For chronic injuries, patients can expect recovery to take about as long as symptoms have been around. 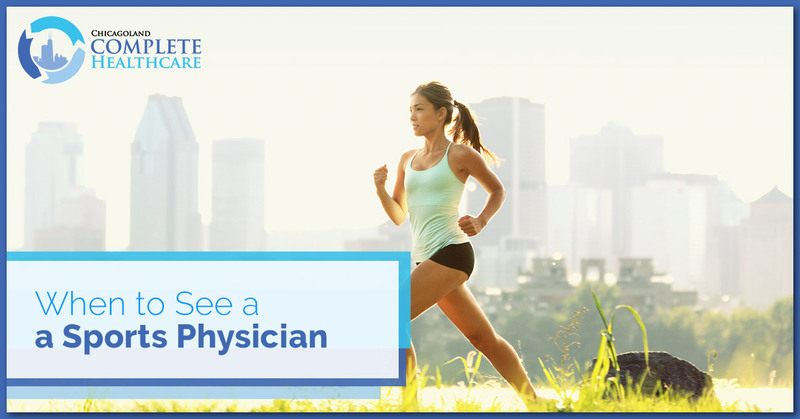 Whether you’re dealing with a chronic injury that has worn out its welcome or you just sustained an acute injury while you were working out, you may need a sports physician. If you’re in the Chicago area, call Chicagoland Complete Healthcare to learn how we can help you today.